site built on Google Sites, you might be interested in earning revenue with Google AdSense. AdSense allows website publishers such as yourself to show targeted ads on their sites and earn revenue from their traffic. It also helps visitors find things they may be interested in based on the content of those sites. Over 1 million publishers use AdSense to monetize the content on the sites they’ve worked so hard to build. AdSense shows ads relevant to the content of the site and you can easily customize the look and feel of the ads to match your site. For example, if your site is about fashion, you may show ads for shoe designers or clothing stores. If a page on your site is about cars, you may see ads for car dealerships or auto shops on that page. Using filters, you can control the content of the ads you display by choosing to block categories of ads or even specific advertisers. 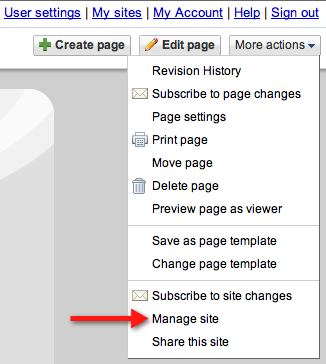 Click the More actions drop-down menu at the top right of your site, and select Manage site. Click Monetize on the left side of the page. Click the Monetize this site button. Create a new AdSense account or use an existing account. Follow the instructions, depending on the radio button you select. Once you've enabled AdSense, go to any of your site's pages in the edit mode, click Insert, and select AdSense to insert ads within your page. You can also choose to have ads displayed in your global sidebar. To learn even more about Google AdSense, come take our tour. If you have a public site built on Google Sites, you might be interested in earning revenue with Google AdSense. AdSense allows website publishers such as yourself to show targeted ads on their sites and earn revenue from their traffic. It also helps visitors find things they may be interested in based on the content of those sites. Over 1 million publishers use AdSense to monetize the content on the sites they’ve worked so hard to build.